Mouse Hepatic Stellate Cells (MHSC) are one of the important cell type in the liver. Hepatic Stellate Cells play an important role in liver homeostasis, maintenance and regeneration including retinol metabolism. Activation of stellate cells in disease state leads to liver fibrosis, hepatitis B & C, fatty liver disease, diabetes and other chronic diseases. Hepatic Stellate Cells are primary cells derived from human liver and cultured in optimized Hepatic Stellate Cells Growth Medium. MHSCs from Cell Applications, Inc. provide an excellent model system to study many aspects of human liver function, metabolism and pathophysiology. Primary culture of Hepatic Stellate Cells is suitable for many cell-based assays including toxicity, drug screening and metabolism and is a valuable tool to study liver function, physiology and liver diseases. Characterization: Positive for α-smooth muscle actin by ICC staining. 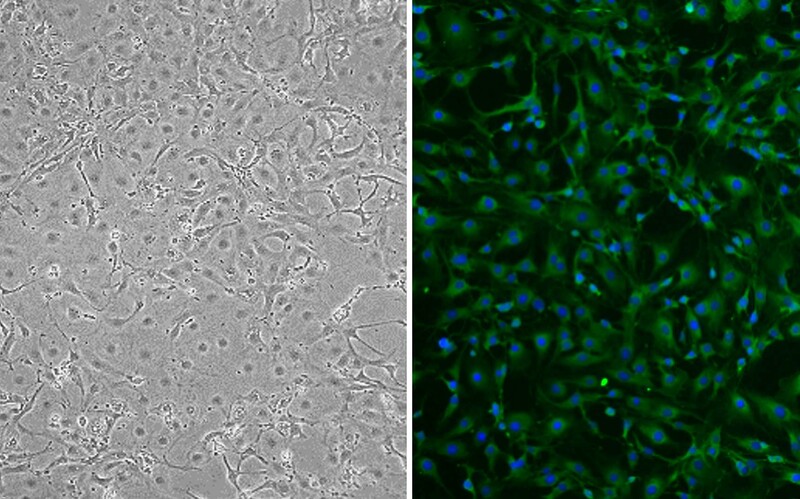 Mouse Hepatic Stellate Cells: MHSC Left: phase contrast, Right: HHF immunolabeled for α-smooth muscle actin (green), nuclei are stained with DAPI.